Vibrant Early Summer Colours, Sweetly Fragrant And They Last For Decades Too! Smothered in huge flower buds before any leaves appear in April, they make a spectacular display. Slow growing and easy to manage, they make the perfect small tree in lawns, borders or large pots. Supplied as 3 plants in 9cm pots, 15-20cm tall, to plant straight out in the garden all year. Create incredible spring displays as early as this April with these stunning Magnolia shrubs. Their heady perfume fills the air and the range of colours and formats makes this a perfect starter collection. What's more, whilst they love garden soil, they will happily grow almost anywhere and they look stunning in pots on your patio. Despite their connoisseur status, anyone can achieve truly amazing displays with these easy-to-grow Magnolias. Compact and slow-growing, they remain a manageable size for even the smallest garden. Totally winter hardy and perennial, so you can enjoy them year-after-year ...for decades! • Magnolia Stellata: Breathe in deeply. The large white flowers that burst out of the silky, silvery buds that cover the bare branches of the aptly named Star Magnolia during March and April are deliciously fragrant. Slow-growing and compact (3m (10ft) in height and 4m (12ft) across) this plant will thrive in most soils. • Magnolia x Soulangeana: One of the most popular magnolias you can grow thanks to a succession of huge, tulip-shaped pinky white flowers that smother the branches of this shrub in mid to late spring. They are shown off to great perfection on the spreading bush as they appear before its dark green leaves. Eventually reaching 6m (20ft) by 6m (20ft) wide, it can be pruned to keep within an allotted area. It prefers acidic soil or pots filled with ericaceous compost. 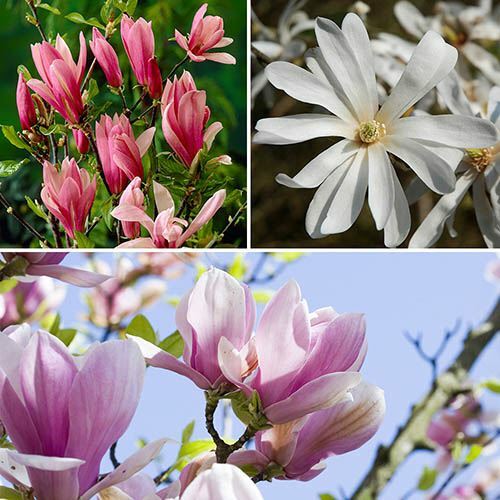 • Magnolia Susan: A perfect specimen for a small garden, this medium-sized magnolia boasts narrow, goblet shaped flowers that appear from near purple buds in April. Measuring almost 15cm (6in) across, each deep pink bloom packs a heady scent. It does best in slightly acidic soil or can be planted in containers of ericaceous compost. This upright shrub will grow to 4m (12ft) high by 3m (10ft) across. Supplied as 3 well-rooted, pot-grown plants in 9cm pots, one of each variety listed. Approx. 20cm tall on arrival. Your Magnolias require little pruning other than to maintain their shape and remove damaged or crossing stems. Do this as soon as possible after flowering to keep the flower buds for the following year. When planting, choose your site carefully as magnolias dislike being moved. Magnolia plants establish quicker when their roots are shaded so apply a mulch of rotted bark chips, manure or garden compost after planting, taking care not to mound it around the stem of the plant. Plant magnolias in a sunny or semi shaded position with protection from cold winds and spring frosts. Magnolias prefer a rich, moist, well drained, acid to neutral soil so incorporate plenty of well-rotted manure or garden compost to improve the soil prior to planting. To plant, water your potted plant well.